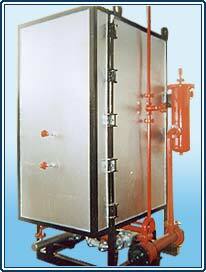 We are the manufacturers and suppliers of Ammonia Cracker Unit. We have in house facility and expertise for manufacturing of various Pressure Vessels, Reactors, Absorbers, Columns, Heat Exchangers, Tanks etc. Process Description Ammonia is dissociated to form H2 and N2 in presence of Nickel Catalyst at a temperature of around 900ºC. The Cracked Gas produced is further purified through Purification Unit. Main application of Cracked Gas is in heat treatment i.e. sintering, brazing, bright annealing of S.S. Wire Production, Blade Production, S.S. Strip and Components Annealing. We are manufacturers and suppliers of Hydrogen Gas Purifier. We have in house facility and expertise for manufacturing of various Pressure Vessels, Reactors, Adsorbers, Columns, Heat Exchangers, Tanks etc. Nuberg takes pride in providing quality equipments for Gas Generation, Gas Drying and Gas Purification systems. These equipments can be skid mounted and may be operated through PLC. We have numerous satisfied customers across the globe spreading over wide range of industry. Plant Capacity 1- 500 Nm³/Hr. 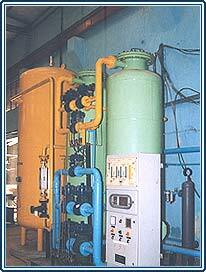 Process Description This is ammonia cracker based hydrogen gas generator. Cracked ammonia is passed through special grade of desiccant in twin tower system ( PSA Type ) having properties of adsorption of Nitrogen molecules at faster rate than hydrogen molecules.